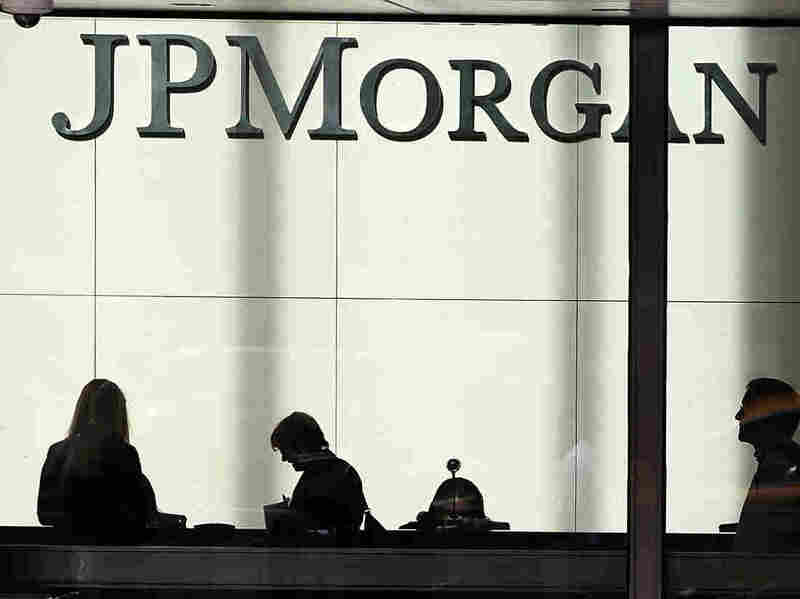 JPMorgan, Dogged By Legal Costs, Reports Hefty 3Q Loss : The Two-Way The country's biggest bank by assets is reeling from a $920 million penalty for failing to control risky trades and faces a multi-billion dollar settlement for mortgage abuse. People pass a sign for JPMorgan Chase at its headquarters in Manhattan last year. JPMorgan Chase & Co., the largest U.S. bank by assets, is reporting a surprise third-quarter loss that comes on the heels of a nearly $1 billion settlement with federal regulators over risky trades. The bank's $380 million loss for the July-to-September period compares to a then-record profit of $5.7 billion a year earlier. Last month, JPMorgan agreed to pay $920 million after it admitted that it failed to oversee trading that resulted in a $6 billion loss last year. It blamed heavy legal costs for the quarterly loss. Even so, its adjusted earnings beat Wall Street expectations, The Associated Press says. September's legal settlement came after regulators, including the Securities and Exchange Commission and the Office of the Comptroller of the Currency, said that JPMorgan failed to control risk when traders made complex derivative bets that ultimately led to the losses. Two months ago, Bruno Iksil, a London-based trader who placed the bad bets, was charged along with another trader with covering up the losses. Iksil has since agreed to cooperate with authorities to avoid prosecution. JPMorgan also faces allegations of mortgage abuse stemming from its purchase of Washington Mutual and Bear Stearns, both at the center of the subprime meltdown. JPMorgan is reportedly in talks with federal and federal and state authorities to pay $11 billion in that case.